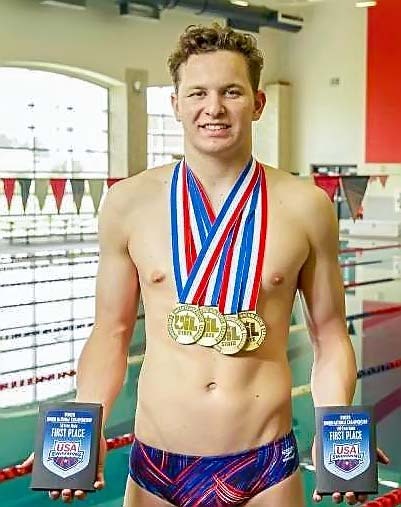 Manvel's Jack Armstrong named Male "Swimmer of the Year"
MANVEL — It came as no surprise that Manvel swimmer Jack Armstrong would garner the top male "Swimmer of the Year" honors by the Houston Chronicle after his spectacular swim season. Armstrong is a two-time state champion at the UIL state swim meet having captured gold medals in the 50-yard and 100-yard freestyle events to secure back-to-back titles. While winning both events his junior year, he turned in an even more impressive performance his senior year including the fastest time in the state in the 100 free regardless of class. He has five state medals (four gold and one bronze) while also winning the events at district and regionals three times while being named MVP multiple times. Armstrong was named the Most Valuable Swimmer at the Class 5A state swim meet. Both times in the 50 and 100 were 5A records. He set the 50 record with a time of 20.10 and the 100 with a time of 43.96. The Auburn signee also won the Speedo Junior Nationals with a time of 19.81 in the 50 and 43.35 in the 100.